This route was pioneered and climbed by Alaska mountaineering legend Bradford Washburn. 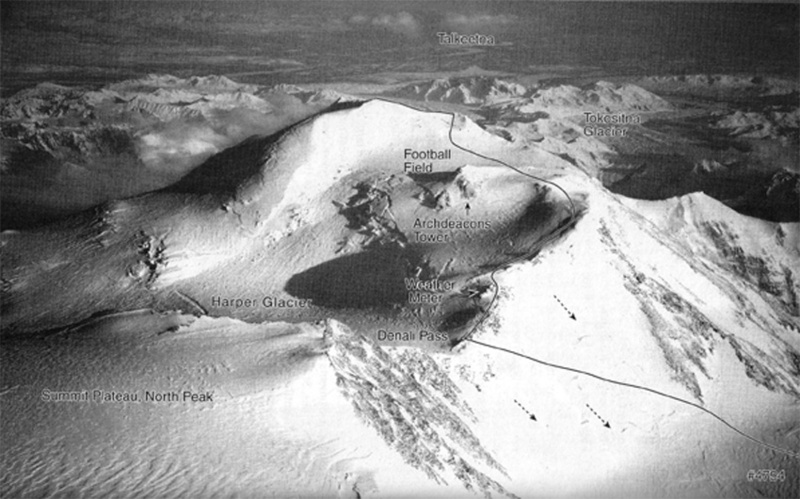 In 1936 he took high-resolution pictures of the mountain from an airplane for the National Geographic Society, some of which are shown on this page. In 1951 he led an expedition that was the first to climb the route, which is often called the Washburn route in his honor. His wife, along with several others, accompanied him, and Barbara Washburn became the first woman to summit Denali. 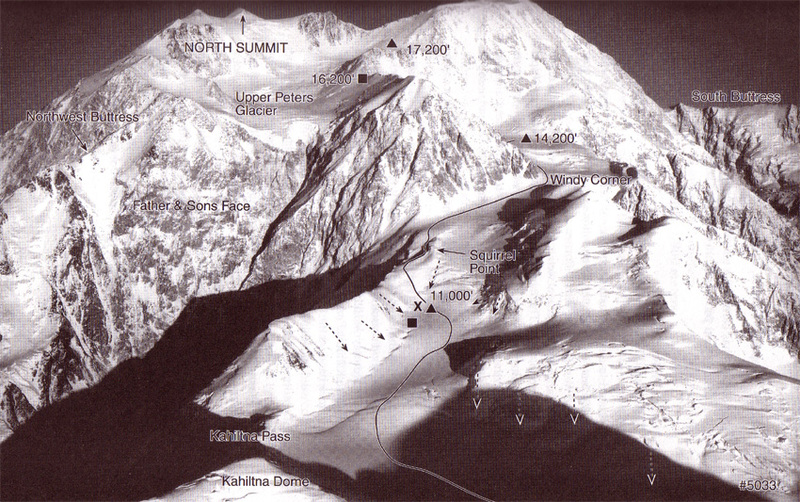 The West Buttress route is the most accessible way up the mountain with about 80% of Denali climbers using this route. Its advantages include a relatively low technical approach and its disadvantage is that it is a somewhat non-direct approach and therefore takes longer. The photo above shows the major camps as red triangles. These are at the 7,200, 7,800, 14,280 and 17,200 foot levels. 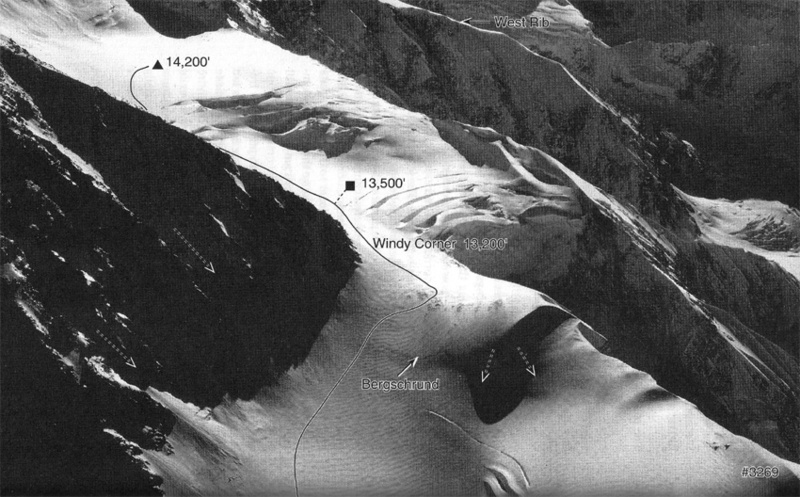 The 11,000' camp is not shown as it is behind a peak. This next photo shows Ski Hill, which is between 7,800' and roughly 9,700'. These photos provide an idea of the slope. It is relatively mild but climbers are carrying approximately 25 kg packs and hauling somewhere around 30 kgs in sleds while wearing snow shoes. These pictures also show major crevasses but do not really show all the minor ones that may be encountered, which are usually covered by snow bridges. On the lower mountain (11,000' and below) climbers typically travel at night. The colder temperatures allows for stronger snow bridges than during the day when the sun is out and effectively making them potentially weaker. 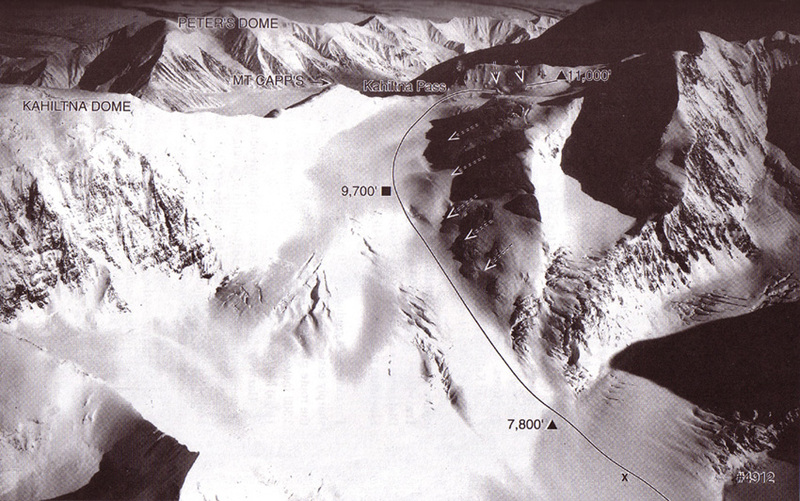 The arrows show the direction of avalanches and rock falls. In general the West Buttress route is mostly free from these hazards. 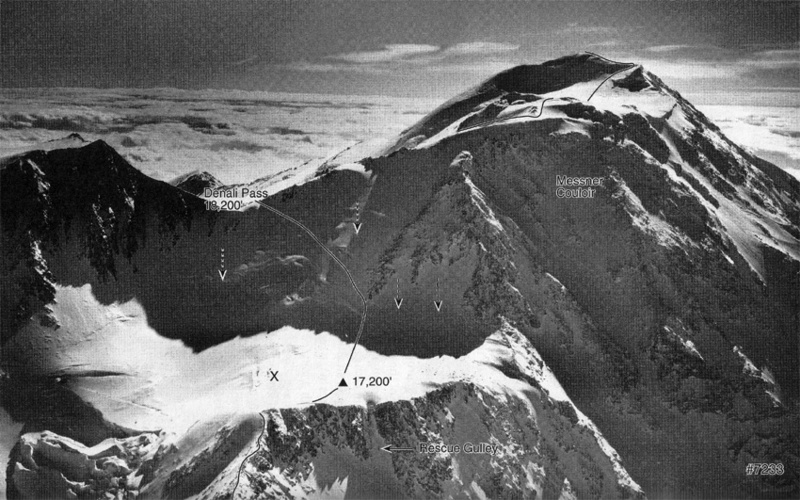 The next photo shows 11,000' camp. There is a steep hill just above camp called Motorcycle Hill. Above that is a point overlooking the Peters glacier called Squirrel Point. Apparently, someone actually found a live squirrel there surviving by eating cached food. Thi seems a little unbelievable because it is surrounded by acres of ice and snow in every direction. 11,000' camp is typically where you might cache your snowshoes until your return down the mountain. The video below shows what 11000' camp looks like on a good day. Windy Corner is identified in the next photo. Often expeditions have to wait above or below for the winds to die down in order to make it past that point. An unarrested slip here could be serious, and so protection is often placed to reduce the fall danger. The camp at 14,280' in the Genet Basin is the next photo. There is a Park Ranger presence here with staff permanently located in camp. The joke is that once you reach here you are done with the approach and are ready to begin the actual climb. Most climbers do not see the humour in that. The climb from 14,280' to 16,200' is pretty steep and the last few hundred feet are on fixed lines maintained by the rangers. The traverse from 16,200' to 17,200' is along a narrow ridgeline which can be dangerous if the wind is blowing. 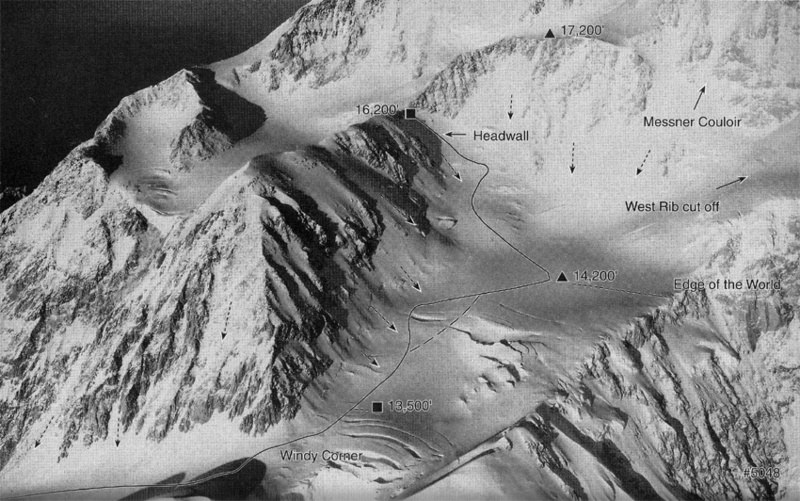 The following photo shows high camp at 17,200'.